WASHINGTON, DC, March 11, 2014 (ENS) – President Obama Barack Tuesday established the first shoreline addition to the California Coastal National Monument. Using his authorities under the Antiquities Act, he designated the Point Arena-Stornetta Unit, protecting 1,665 acres along a spectacular stretch of public lands on the Mendocino coastline in Northern California. In 2000, President Bill Clinton established the California Coastal National Monument, encompassing more than 20,000 rocks, islands, exposed reefs, and pinnacles along the 1,100 miles of California’s coast. President Obama’s action builds upon that vision, protecting coastal bluffs and shelves, tide pools, onshore dunes, coastal prairies, riverbanks, and the mouth and estuary of the Garcia River. Located about 120 miles north of San Francisco, the Point Arena-Stornetta Public Lands adjoin Manchester Beach State Park, the Point Arena Lighthouse, and the California Coastal National Monument. 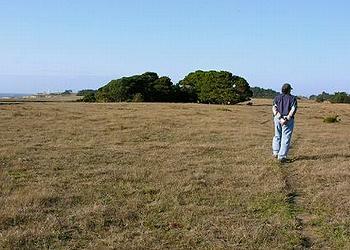 These lands are a destination for thousands of visitors every year, who enjoy wildlife viewing, hiking and fishing. In California, outdoor recreation on public lands managed by the Bureau of Land Management contributed nearly $900 million to the economy in 2012. “The rugged coastline of Point Arena-Stornetta is simply breathtaking and a deserving addition to the California Coastal National Monument,” said Secretary of the Interior Sally Jewell, who hosted a public meeting in Point Arena in November. “President Obama is supporting the community’s vision to conserve this landscape and, in doing so, strengthening the local economy through increased tourism and outdoor recreation,” she said. Located in Mendocino County, the Point Arena-Stornetta Public Lands encompass a wind-swept landscape of dramatic coastal beauty and significant scientific importance, shaped by powerful geologic forces. An uplifted coastal terrace that underlies much of the area is part of the Gualala Block, a piece of continental crust that was captured by the San Andreas Fault and is now joined to the Pacific Plate. The bluffs that form the outer edge of the terrace are pierced in a few locations by blowholes that propel gusts of salt-laced air and geysers of ocean water high above the shore. 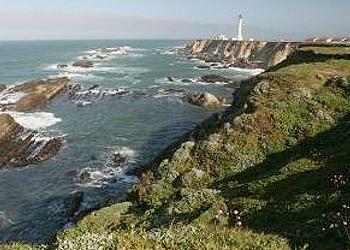 The Point Arena-Stornetta Public Lands provide habitat for harbor seals, Steller sea lions and elephant seals. The terrace supports thriving native bunchgrass prairie and coastal scrub communities. Low-lying vegetation is punctuated by a rare bishop pine forest and the southernmost natural example of a shore pine forest. Native to this area and found nowhere else on Earth are the Point Arena mountain beaver and the Behren’s silverspot butterfly, which is dependent on the presence of the dog violet. A wide array of rare bird species inhabit this coastline, including the black oystercatcher, the little willow flycatcher, the yellow warbler, and the black-crowned night heron. Squadrons of brown pelicans glide over the waves, while snowy plovers forage along the surf line. At the northern end of these lands, the Garcia River ends its 44-mile journey to the Pacific. Its estuary provides a nursery for juvenile fish and a transition zone for central California coast coho salmon, California coastal Chinook salmon, and northern California steelhead to access their upstream spawning habitat. Hathaway Creek flows into the Garcia River across these public lands. The area’s salt marshes, brackish pools, and freshwater springs and seeps support Humboldt Bay owl’s clover and the rare California red-legged frog. Thousands of years of human history is written across the landscape of the Point Arena-Stornetta Public Lands, which lie within the ancestral lands of the Central Pomo Indians. 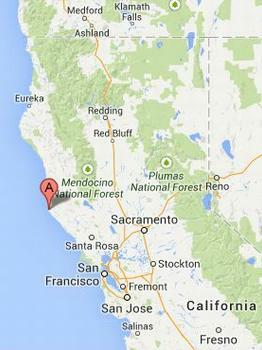 Numerous cultural and archeological sites, including middens, chert and obsidian tools, have been found here. Among the oldest artifacts found in the area are obsidian chips from toolmaking dated to more than 4,000 years ago. The President’s proclamation honors years of work by the local community and businesses seeking increased protection and recognition for the area, including Larry Stornetta, whose family helped care for this land and sold part of the ranch so the public could access it. Stornetta was present at the White House to witness the signing of the proclamation. Also present were Congressmen Jared Huffman and Mike Thompson, who championed legislation to include the Point Arena-Stornetta Public Lands in the California Coastal National Monument. Last July, the House of Representatives unanimously passed Huffman’s first bill as a U.S. Congressman to expand the California Coastal National Monument to include the Point Arena-Stornetta Public Lands. Congressman Mike Thompson had twice introduced legislation in the 111th and 112th Congresses to protect this land. 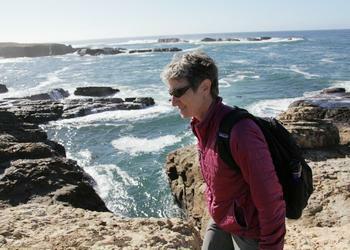 “The Point Arena-Stornetta Public Lands are a national treasure,” he said Tuesday. Also in support of the expansion are U.S. Senators Barbara Boxer and Dianne Feinstein of California. In 2004, in partnership with the State Coastal Conservancy, the Wildlife Conservation Board, the U.S. Fish and Wildlife Service, the state of California and the Bureau of Land Management, The Nature Conservancy purchased just over 1,200 acres of land that would become the heart of the BLM-managed Stornetta Public Lands. The monument will continue to be managed by the Bureau of Land Management as part of the system of National Conservation Lands. Current agricultural activities such as grazing are not affected by the designation. The Bureau of Land Management acquired the Point Arena-Stornetta Public Lands following years of work with private land owners and partners. The Land and Water Conservation Fund provided funding to support the local effort to make these lands publicly accessible. In his budget released last week, the President requested that the Congress fully funds the Land and Water Conservation Fund at $900 million in Fiscal Year 2015 to support additional local conservation priorities across the country. The monument expansion is part of President Obama’s America’s Great Outdoors initiative. With the Omnibus Public Land Management Act of 2009, he created the most extensive expansion of land and water conservation in more than a generation, designating more than two million acres of federal wilderness, thousands of miles of trails, and protecting more than 1,000 miles of rivers. President Obama has established 10 other National Monuments across the country: in Ohio, Delaware, Maryland, Washington, Colorado, Virginia and two in New Mexico. This is his third national monument in California.